We met the team from Aussie Destinations Unknown at the recent Adventure Bash on the Sunny Coast – What a weekend! We all had so much fun and Miriam & Chris filled us in on their up and coming event to help raise money for our farmers! We asked Miriam to share with us a little bit about themselves and also give us all the details about the FUNdraise for Farmers. 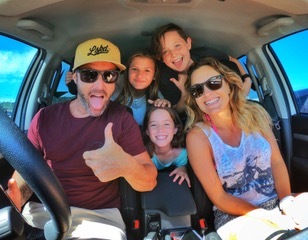 ADU is the beloved project of me (Miriam) Chris and our three children; your average Aussie family with a passion for adventure and a love of caravanning. We have always loved camping and started like so many people do, with a tent and lots of ‘gear’. 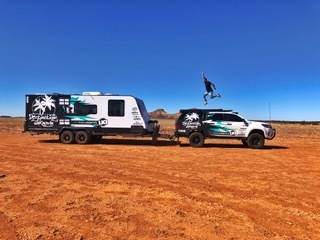 We soon moved up to a camper trailer (that Chris built in our back yard) and from there it was a little pop top caravan (Jayco Discovery) and we now have our Jayco Starcraft Outback and Alucab Rooftop Tent. When it’s just the two of us we often use the rooftop as it’s such a simple set up. The back of the Hilux is permanently packed, so it never takes long for us to head off once we’ve chosen our destination. Leaving the caravan behind also allows us to get to some locations that are a little trickier with a large van like ours in tow. We travel with the kids half of the time and we enjoy it as much as when we travel by ourselves. It’s a totally different experience that takes a little more planning and a lot more cooking and washing! Our kids have grown up with this lifestyle and all have their own jobs and know what to do to help out. It gets better as they get older! On the longer trips during the school holidays we have the kids for half of the time and we plan accordingly; like our Tassie trip this year. We will do all the things the kids will enjoy like Mt. Wellington, Port Arthur, the East Coast and spend Christmas with my family while they are with us and after they fly out in early January we will do the more ‘adult things’ like mountain biking at Derby and the West Coast/Gordon River Cruise with my parents. And while we enjoy our weekend getaways around South East Queensland and Northern New South Wales, and the longer trips that we take during the school holidays, Chris and I would love to be on the road full-time and are working towards this. Once our kids leave high school is when we are planning to sell up and take off. One of our biggest challenges at the moment is finding time get to the places we really want to see. Chris runs a successful signage company, Brandcraft, and I run a holistic health and fitness business, MiMFiT both based out of Brisbane. Our hours are quite flexible which gives us a little more time than couples working full time, but we still have to put enough time and energy into them to keep them running. I do absolutely love my job though and fully intend on bringing the online part with us when we hit the road. One of our most memorable adventures to date was when we went out to The Big Red Bash, the most remote concert on the planet held on the edge of the Simpson Desert. 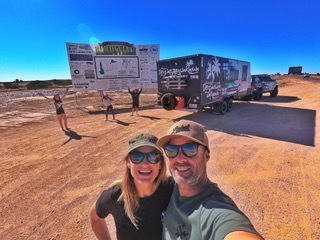 The event itself was incredible and venturing into the outback was one of the most eye-opening things we have ever done. You can read our blog posts here: Big Red Bash. This ongoing drought has had a huge environmental, financial and emotional toll on many agricultural businesses right throughout Queensland. I have read that two-thirds of the state, or 120 million hectares has been experiencing severe rainfall deficit for almost 8 years. I have also read that farmers are so desperate that sadly some have resorted to taking their own lives. In Australia a farmer is twice as likely to commit suicide. We love camping and we want to help – so we came up with a brilliant idea! 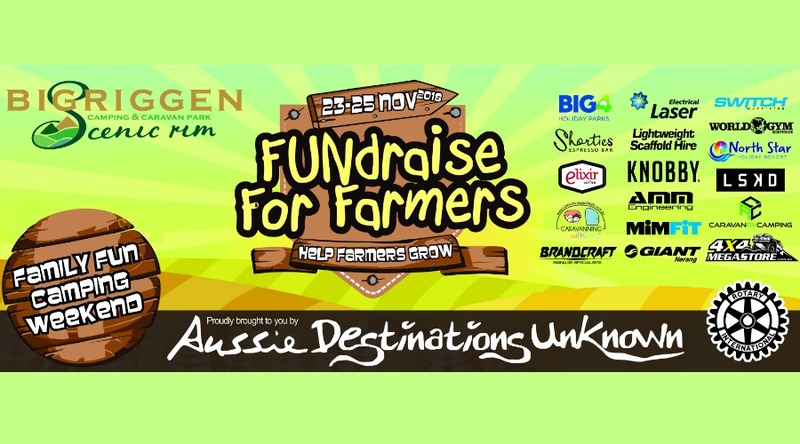 ‘FUNdraise for Farmers’ is a camping weekend filled with crazy Aussie outback fun with all money raised going through the Rotary Club of Sydney to the Barrumbuttock Hayrunners helping them to deliver donated hay where it’s needed most. This is looking set to be one of the best weekends on your caravanning and camping calendar for 2018. We have some awesome prizes to be won in one our raffles or by entering some of our crazy events like the Farmer Fun Run, Farmer Fashion Parade and more. It will be held on Nov 23-25, 2018 at the beautiful Bigriggen Campground on the Scenic Rim which is about 1 ½ hours from either Gold Coast or Brisbane. Come and join us for this family friendly outback themed weekend, jam packed with fun activities, live music, food, drink and coffee vans, games, entertainment, farmer fashion parades, prizes and heaps more. Bring your swimmers, wear your cowboy hat and don’t forget to pack your dancing boots!! It’s time to bring out your inner jillaroo and jackaroo and open up your wallets. Let’s show our Aussie farmers how much we appreciate what they do and give give give! Camp for the weekend or just come for the day. For those who can’t attend, we will be selling a range of merchandise that you will be able to purchase online and have delivered to your home. Please keep an eye on the Aussie Destinations Unknown Facebook page for updates. We have a rapidly growing pile of awesome prizes to give away and raffle off on Saturday. Please let us know if you would like to donate. The International Lions Club of Underwood will be there all weekend with their awesome BBQ setup and we will also have other food/coffee vendors on site. Uplifting, fast, feisty fek’in fun Celtic Cowbhoys are performing Friday night and well-known country singer Tyson Coleman is live on stage Saturday night. We also have Dj Mason Maffick spinning foot stomping, smile provoking, upbeat songs throughout the day to set the outback mood. Ticket pricing includes camping fees. Weekend Pass is for entry 9am Friday and checkout Sunday morning. Day pass is valid from 9am-6pm Saturday only. 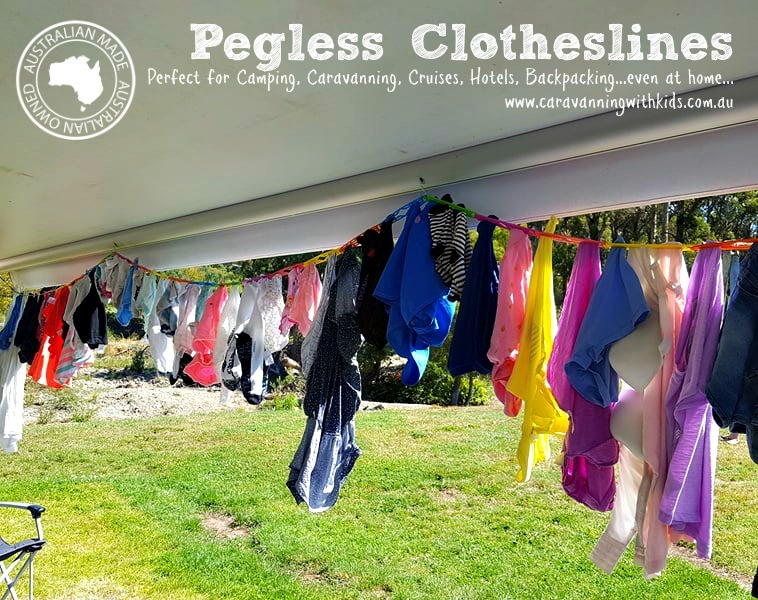 Caravanning with Kids are very proud to help with this event – we have donated lots of packets of our popular Aussie Made Pegless Clotheslines…. Have fun everyone! !